Posted on March 3, 2018 by Mrs P.
Crime bloggers around the world were hugely saddened this week to hear that Australian blogger Bernadette Bean, also known as @BSquaredInOz, has passed away. Bernadette was a literary powerhouse. She ran not just one, but two blogs – the wide-ranging literary blog Reactions to Reading, and, together with fellow blogger Kerrie, the Australian crime fiction blog Fair Dinkum Crime. I remember nearly falling off my chair the first time I read one of Bernadette’s end-of-year round-ups – the volume and range of her reading were truly phenomenal. Here’s her ‘goals update’ from 2017. And just check out those amazing charts! I never had the pleasure of meeting Bernadette, but for many years enjoyed a virtual friendship across the waves, bound by a love of reading, an eclectic taste in crime fiction, and similar outlooks on life. She was an absolutely brilliant blogger, who wrote consistently excellent reviews. I had enormous respect for her as a critic and writer, and always made an effort to keep up with her posts, because I knew I’d find an interesting new read or learn something new about a book I’d already read. She was never afraid to say what she thought about a book (good or bad), but either way, her views were always backed up with reasoned arguments and well-chosen examples. She also made me laugh. Because Bernadette was based in Australia, her readers naturally learned a great deal about Australian crime fiction, and about Australian fiction by women writers (for many years she took part in The Australian Women Writers Challenge). I loved the different literary worlds she opened up for me and found her love of literature truly inspiring. There’s a wonderful tribute to Bernadette by Kerrie over at Fair Dinkum Crime, together with a list of other tributes written this week. I know that I will continue to pop over to both of Bernadette’s blogs. I’d barely scratched the surface of her recommendations, and am looking forward to finding some gems to read in her memory. 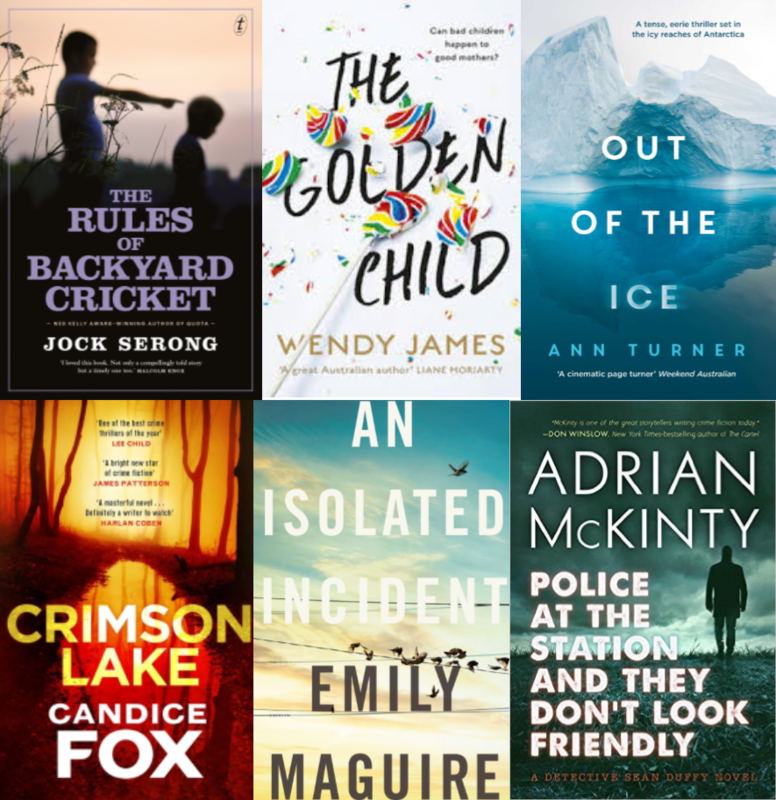 My starting point is this post from last August, ‘Musings on 2017’s Australian crime writing awards’. Thanks so much for everything, B. Gonna miss you. This entry was posted in Australia, By country by Mrs P.. Bookmark the permalink. This is lovely. And you’re so right about Bernadette’s wit and brilliance as a reviewer. I was astounded by her skill. And, yes, those charts were great. She was also such a delightful person. I felt privileged to be her friend and I will miss her very much. I couldn’t agree with you more. I loved Bernadette’s blog and appreciated all I learned about Australian fiction from her, but most of all I valued her honesty and integrity and the gift she had for describing how she felt about a book. I struggle with that every time I write about a book, and it seemed to come so easy to her. Absolutely, Tracy. Her viewpoint always felt very honest and fresh, and she had a knack for homing in on what was interesting about a work. I’m going to miss Bernadette and her blog. It was one of my first stopping points every day. I enjoyed her book reviews, critiques of crime fiction and the publishing world, and her brilliant wit. Bernadette always kept me laughing when she panned a book. of books. And I discovered Australian crime fiction, especially by women writers. to reciprocate, she’d say no need to do that. I hope her blog stays up so her loyal readers can go back and reread blogs or look up reviews. Thanks so much, Kathy D. This is such a lovely tribute to Bernadette, and sums up so many of her best qualities. I always admired her for reviewing books she didn’t like as well as the ones she did. She was fearless in that respect, and it was a service clearly valued by her readers. How lovely that she sent you books as well. Like you, I very much hope that her blog will stay up so that we can all still benefit – it’s an absolute treasure trove. I just learned about her death today as I am not online much anymore. Her death does give us that nasty reminder that you can be here today and gone tomorrow. I will miss her voice in the community. Gonna miss those reviews. She was such an excellent writer. I remember asking her early on like what’s your secret?? because she had such wonderful writing skills and I remember telling her how much I loved her writing. A lesson learned from Bernadette: Do not finish books you do not like. Move on. Increasingly, she said she was doing this, and it’s something I learned from her.